Plan Filing or Plan Storage is the activity to systematically file, store and group a variety of building plans, architectural drawings or blueprints with the purpose to retrieve each plan or drawing in the most efficient and economical way. The most common plans used for Planfiling are architectural drawings which are defined as: "a technical drawing of a building (or building project) that falls within the definition of architecture. Architectural drawings are used by architects and others for a number of purposes: to develop a design idea into a coherent proposal, to communicate ideas and concepts, to convince clients of the merits of a design, to enable a building contractor to construct it, as a record of the completed work, and to make a record of a building that already exists (Wikipidea June 2018). Architectural plans or building plans are available in standard paper sizes. The international standard is ISO 216. It is based on the German DIN 476 standard for paper sizes. ISO paper sizes are all based on a single aspect ratio of the square root of 2. There are different series (Serie A, Serie B, Serie C) as well as several extensions. The following international paper sizes are included in Cascading Style Sheets (CSS): A3, A4, A5, B4 and B5. The most widely used sizes for general printing and letterhead stationery is the A series and defined as A0, A1, A2, A3 and A4. 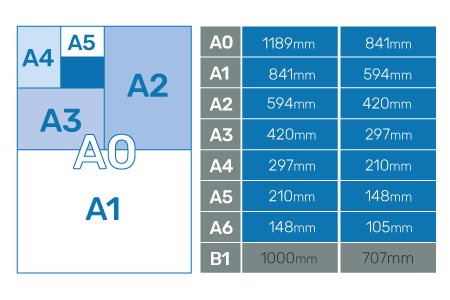 The below illustration represents the ISO A-Series and the international paper standard sizes in mm. With the introduction of building, architectural and professional CAD drawing software and the ability to print these detailed drawings and images on large format printers and plotters, the demand to file, group and store these plans was created. Over the years many different plan filing systems have been introduced, ranging from A0 sized cabinets and drawers to horizontal and vertical plan filing cabinets. Horizontal Plan cabinets with multiple drawers have been extremely popular over the years. They are available in 5 or 10 drawer versions and can be usually stacked or placed next to each other. The main disadvantage of this system is based on the long production lead time (up to 6 weeks), weight and the cost of transport in case of first time purchase or relocation. Also from a practical point of view, the ability to easily group, store retrieve a plan in a horizontal A0 or A1 plan drawer system is considered to be inefficient. The building plan(s) that you need are always filed at the bottom of the drawer(!) and to retrieve that particular document without moving or damaging the large format plans on top appears to be a challenging task. Also mobility of a plan drawing cabinet is considered to be a negative as it is not always easy to move a full cabinet of drawings , with a weight of up to 150-200kg around the office if required. The vertical plan file and plan storage cabinets have been introduced in an attempt to improve the accessibility and retrieval of A0, A1 and B1 sized building plans. Vertical plan file cabinets are used to vertically store single sheet tracings and paper plans where adhesive strips containing pre-cut holes need to be attached to each drawing. The adhesive strip with holes allows each individual drawing to be suspended on internal cabinet fingers. The plans are therefore hanging vertically and individually accessible for easier retrieval compared to a horizontal drawing cabinet. Architectural and building plans can be grouped and filed using dividers. Also these vertical cabinets are usually made of (recycled) powder coated steel and can be locked as a safe for security purposes if required. Disadvantages of the vertical plan filing cabinet system is the delivery lead time of up to 6 weeks, purchase cost and the instability and immobility of the cabinets which often need to be supported by stabilizing feet to allow for overhanging weight when the front door is opened and closed. Also the required suspension strips and dividers add to the cost of plan filing. The plan trolley and plan clamp planfiling system offers the most economical and efficient planstorage system to group, store, file and retrieve architectural plans, drawings, building plans and posters up to paper size A0. Compared to the vertical and horizontal cabinets as discussed above it offers, mobility, delivery from stock, easy grouping, filing and retrieving of the plans and drawings at a very competitive price. The vertical plan trolley and plan hanger system has been the most popular planfiling system in the building and construction industry around the world. 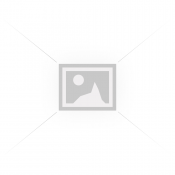 But also other industries have adopted this efficient and cost effective plan storage system. Schools and universities, the medical industries, retail and government departments are using plan clamps and racks to store artwork, posters, medical records and x-rays, fabric samples and signage. That is why Planmate offers the most comprehensive range of plan trolleys, plan hangers, plan racks and more from the 5 biggest brands in Australia and New Zealand. This plan filing system uses plan clamps, also referred to as plan hangers, plan holders, plan sticks, plan binders, plan clips or plan racks. Each plan filing clamp can hold up to 100 building plans, architectural drawings or posters. The plans are clamped and fastened by using a double or triple wing nut system. The plan clamps and binders are spring loaded which allows the user to easily open and close the plan hanger when required. The Hang-A-Plan brand offers an A0 and A1 QUICKFILE plan clamp system for easy filing and release of the plans. 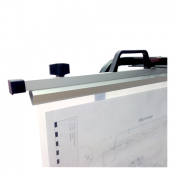 The plan drawing holders can be used to group and file building plans as required. As an example the building drawings can be grouped by project, elevation, detail, site plans, floor plans or cross section. Some plan clamp brands like Draftex supply clamps with transparent indexing clips for filing information. The plan clamps allows the user to carry building plans to site. The handle on top of the plan clamp is designed to easily carry the plan loaded clamps. 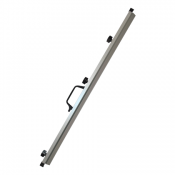 A fully loaded plan hanger with 100 plans can weigh up to 15kg and the top carrying handle is conveniently positioned at pivot point to balance the weight. The plan binders are available in 4 sizes from A2 to A1, B1 and A0. Only the Planmate brand has a plan clamps range that offers all 4 lengths. The A2 plan clamp is often used to store and file (landscape) A3 plans and therefore clamped on the long edge. The planholders and planbinders are stored or clipped in a (mobile) plan trolley or wall rack. The clamps slide into the top of the rack and are safely held in place by either a supporting nut, wingnut or crossbar. The advantage of the plan trolley is its mobility offered by 4 heavy duty brake enabled castor wheels. The wall rack is ideal for site offices where space is often a premium. All plan trolleys offered by PLANMATE are made from heavy duty steel, powder coated and designed for use in an office and/or building site office environment. All plan hanger trolleys offered at Planmate allows the user to conveniently store and retrieve the plan binders due to its front loading design. Most suppliers have a variety of sizes available in capacity and size. Please be aware that an A1 sized trolley only allows you to file A2 and A1 sized clamps due to its restricted height. If you require flexibility in plan filing then the A0 size plan hanger will suit your needs as it supports all plan clamp and paper sizes A2, A1, B1 and A0. Also note that only the Universal brand is compatible with all other brands in both plan clamps and mobile plan trolleys.